As with many American customs, the backyard cookout began as an amalgam of various cultural traditions. In the 1950s, citizens of the United States were doing a lot of vacationing – and for good reason too. The Great Depression and World War II had brought about horrors and hardships. So when the United States experienced a period of affluence in the decades to come, its citizens were all too happy to treat themselves to a taste of the good life. Often times, vacationers became so enamored with the culture and cuisine of places like the Pacific Islands and the Caribbean that they would attempt to recreate their experiences at home. Suburbanites would invite neighbors to enjoy food and drink recipes that they had picked up in foreign lands and to admire the souvenirs they’d collected along the way. Overtime, these developed into themed cookouts with tropical drinks, Tiki torches, and of course, barbecue. Barbecue has a long history in the United States, dating at least as far back as the discovery of the continent by Christopher Columbus. The first indigenous tribes he encountered would cook meat on green wood over indirect flame, preventing the meat – and the wood – from burning. This method, known as “barbacoa,” would later spread to the American colonies. In the centuries to come, barbecue grew in popularity (particularly in the southern United States) but it wasn’t until the 1950s that barbecuing became a common, household cooking practice with the invention of the grill. Created by Don McGlaughlin, owner of the Chicago Combustion Corporation, the first commercial grills were marketed as “open-fire charcoal-type gas broilers.” By 1954, the design was adapted into the first portable gas grill and the outdoor patio became the summer hangout spot for many an American family. 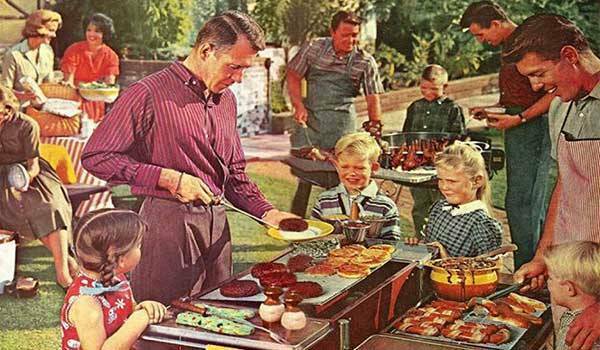 The invention of the grill, coupled with 1950s “meat-mania,” made summertime meals not only fun, but manly. Cooking was widely viewed as women’s work at the time, but something about the ruggedness of cooking outside had husbands volunteering to “man” the grill. of a frankfurter he has personally charcoal-charred, he is hooked as a cook. Perhaps it was this inclusivity that led the cookout to be so widely celebrated as an American summer tradition. It was the perfect way for people of all ages, genders, and backgrounds to enjoy a meal together, and it has remained that way ever since.